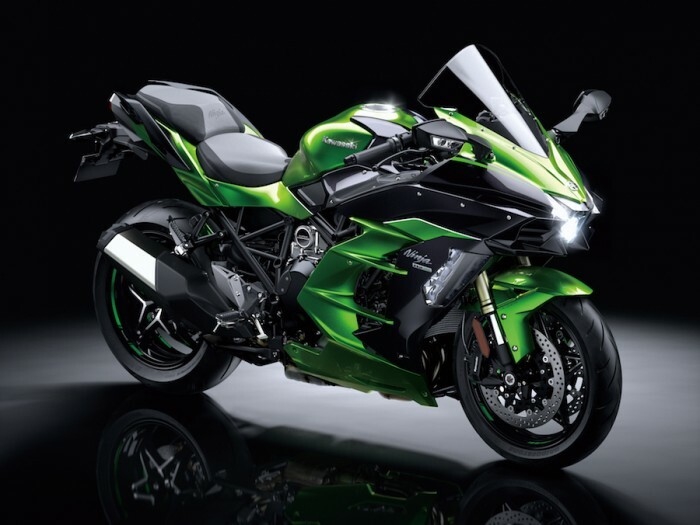 Of course, the big Kawasaki story for us at BSN from EICMA was the new SE version of the ZX-10R superbike. But the big K had a few other treats on show – like the H2 SX supercharged sport-tourer. At first glance, this looks pretty much like the firm’s blown megabike, the H2, with some panniers and a full fairing. But under the similar optics lies an all-new bike, with totally revised engine, unique chassis, plus top-end electronics and rider aids. Before we get into the guts of it though – what is it for? Why would you eschew the firm’s excellent ZZR1400 sport-mega-tourer in favour of this beastie? On the face of it, they have similar power (210-ish bhp), similar mass (the H2SX is 13kg lighter) and are aimed at the same job: slaying continents at high speed with high comfort levels. Well, apart from the obvious charms of *a facking supercharger* on your bike, the SX is a signpost to the future. It’s designed to be more efficient, and use less fuel. So, as an example, the improved MPG means Kawasaki has fitted a 19 litre fuel tank, rather than the 22l job on the ZZR, yet will have more fuel range. So, an incredible, audacious plan. At the heart of it all is a new ‘balanced supercharger’ engine, based on the same basic layout as the H2 and H2R hyperbikes, but with a slew of changes. The aim is clearly to reign in the ultimate potential of the engine, using less boost from the charger, and to make a sort of ‘low-blow’ design. 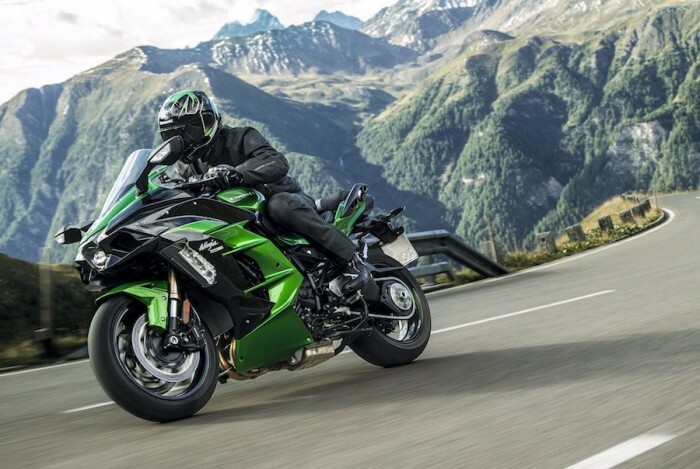 The compression ratio is raised to a beefy 11.2:1 (from 8.5:1 on the H2), and while that’s low for a sportsbike (the ZX-10R uses 13:1), it’s high for a charged engine. What it does mean is when ‘off-boost’, you get more power from the engine, and better efficiency. But when you do increase the intake pressure, you can’t do it as much before you run into detonation and knocking, which kills power (and the engine). Smaller throttle bodies, shorter duration/overlap camshafts and narrower inlet and exhaust ports – they all make for stronger low- and midrange power, while reducing the ultimate maximum power output of the motor. Controlling all this is a ride-by-wire engine management system, with a blow-off valve to control boost. It’s got all of Kawasaki’s latest gizmos, with all the mad acronyms. Kawasaki traction control, Kawasaki launch control, engine brake control, power modes, cornering ABS, and Kawasaki’s quickshifter, plus cruise control. On the chassis front, Kawasaki had to substantially mod the frame to accommodate a pillion (the H2 and H2R are single-seaters) and luggage. The new trellis design can cope with a 195kg load in total. The swingarm is still a single-sider, and is 15mm longer, adding to the longer wheelbase (25mm more in total than the H2). Suspension is fully-adjustable at both ends, with a piggyback Kayaba shock and remote preload adjuster. No cunning electronic adjustment though – about the only significant tech field missing on this bike. Kawasaki’s building two versions of the SX – a base and an SE version. 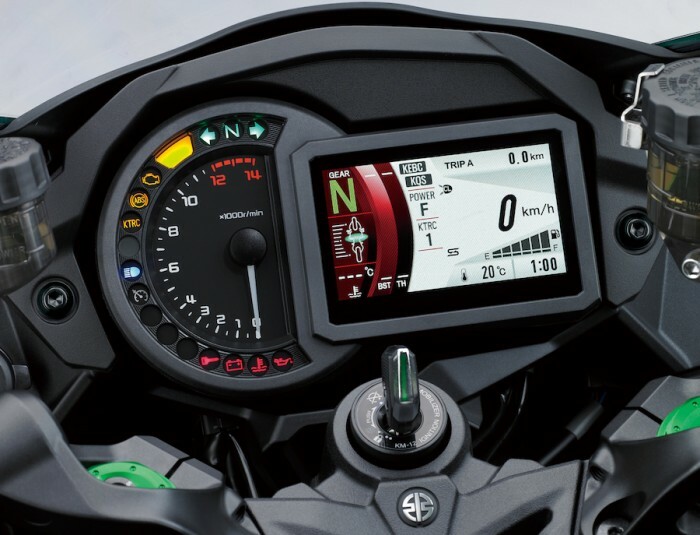 The SE has a few extra trickeries: LED cornering lighting, and a tricker full colour LCD dashboard. The SE also has the quickshifter and the Launch Control functions, plus a higher screen, suede seat, steel brake hoses and fancier machined wheels. No word on price as yet - but we should know by the NEC show at the end of this week (where you can, of course, see the H2 SX for yourself).